What’s the difference between Japanese kombucha and western world kombucha? 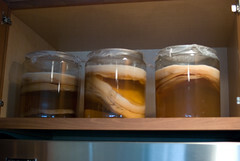 Recently, Kombucha has gained a lot of reputation and popularity in United States and European countries. The word kombucha originated from Japan but meaning has changed and Kombucha now points out two different things. When people in western culture think of kombucha, they are talking about acidic fermented tea originated from Northeast China and Russia that contains many bacteria and yeasts. However, Japanese kombucha, is made from kombu kelp, as the word kombucha directly translates to “kombu kelp tea”. Japanese kombucha is made from regular or powdered kombu often mixed with green tea and poured over hot water, while western kombucha is made from dividing yeast from kombucha mother. Kombu kelp contains rich minerals and Umami, making plain water full of tastes. In Japan, western kombucha were called “mushroom red tea” because of all the fungus and how layer of bacteria looks like umbrella in the fermenting process. Western kombucha have gained popularity on 1970’s in Japan due to its health reason and easy to reproduce between families with low cost. Now, how did change in the meaning of kombucha occurred? Its etymology has not been certain but it is believed that thick gelatin layer on the tea resembled seaweed, thus, getting the name kombucha. Kombucha might mean different in Japan and US, but both teas have a lot of health and beauty benefit by consuming them. Why not try both kombucha and share this trivia to people who love drinking western kombucha.